In this video Master Wholesale President Blake Adsero compares an Imer Bridge Saw to a Dewalt Tile Saw with a sliding table. These are two different approaches to the same result of getting the cleanest and straightest cut on the tiles you are cutting. Each saw has it's advantages and disadvantages. Starting with the Imer, this is a large and some what heavier tile cutting saw, but it's advantage comes in when you need to cut larger tiles. 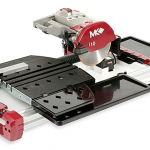 This is because it does not have an arm mounting the motor and tile saw blade to the saw base that can get in the way when cutting across longer tiles. 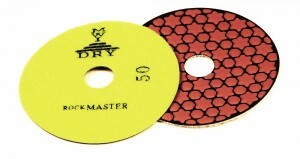 It can produce miter cuts at any angle from 0 to 45 degrees, and is more stable making precise cuts with ease. Next we have the Dewalt Wet Tile Saw. This saw is lighter, easier to maneuver around the worksite, and less expensive but has it's drawbacks as well. For cutting large format tiles the bridge saw is going to have the most available cutting angles, giving it better versatility. The Dewalt will do miter cuts at 22.5 degrees and 45 degrees only. Both of these tile cutting saws are very well made and each has it's place in the tile setter's arsenal. It just depends what exactly you are looking for in a tile saw. This entry was posted in Reviews and tagged wet tile saws, imer bridge saw, imer tile saw, dewalt tile saw, dewalt wet tile saw, bridge saw vs table saw, tile saw comparison on September 11, 2017 by mwhoadmin. This entry was posted in Reviews and tagged glass cutting blades, diamond blades for glass, resin bond glass blades, resin bond diamond blades for glass cutting, montolit glass blade on December 12, 2016 by mwhoadmin. In this video Blake, compares the Johnson 40-6166, Dewalt DW0811. Bosch GCL25 and the Johnson 40-6602 laser levels. This entry was posted in Reviews and tagged tiling, flooring, DIY, laser levels, leveling on December 30, 2015 by mwhoadmin. In this video, Blake compares the performance of three popular tile cutters: the Ishii Big Clinker, the Sigma 3C2 and the Superior Piano Board cutter. This entry was posted in Reviews and tagged tile saws, construction, tiling, flooring, ceramic tile on November 24, 2014 by Badsero. Fein started it all with the MultiMaster; an oscillating hand tool that allows you to quickly cut, strip, scrape, sand, and just about anything else in areas that would be impossible to reach with standard tools. These tools are really indispensable, and once you’ve owned one, you will always have one in your toolbox because they save so much time. There are now a wide variety of brands available. We are going to review 3 that we carry here at Master Wholesale, and that we use, or have used regularly. The original oscillating tool, you can tell when you pick it up it is the real deal. It’s relatively heavy, but in a reassuring way. I have personally used this particular tool for many years, on many projects, and it hasn’t had a single issue. Everything about it is robust, including the 16 ½’, power cord which is both flexible and durable. 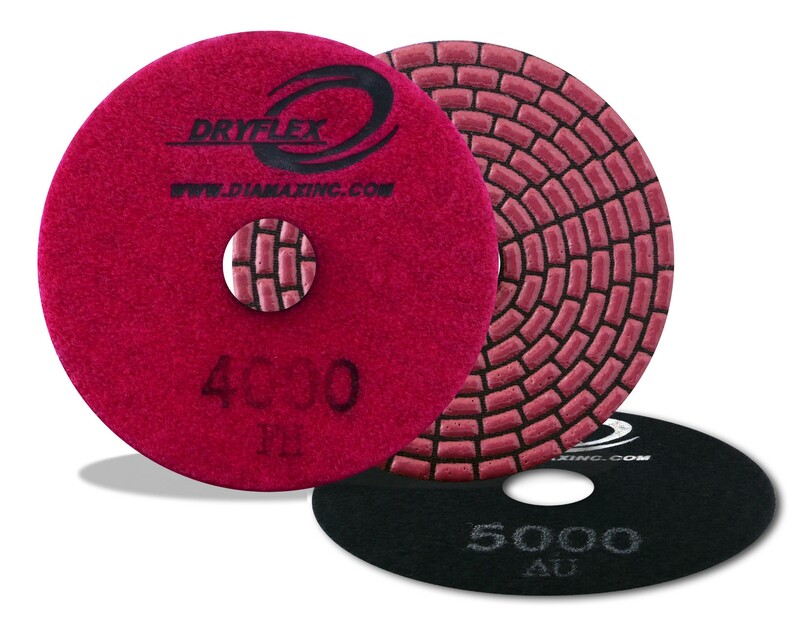 There is no discernible flexing of the dense matte plastic housing during heavy use. Despite oscillating at between 10,000 and almost 20,000 RPM, it doesn’t create excessive hand fatigue. The weight of the tool, coupled with it’s precise balance and anti-vibration system, makes the MultiMaster surprisingly comfortable to use. The blade change mechanism is top notch as well. This tool has plenty of power, and you’ll find that when pushed, the material is going to be the thing smoking, and not the Fein. 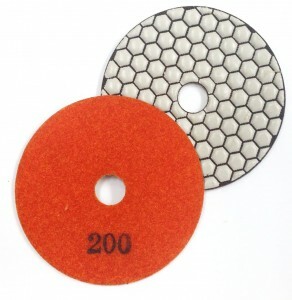 The Fein also has the largest selection, and highest quality blades, scrapers and sanding accessories available. Overall, their status at the top is unchallenged, and they are priced accordingly. 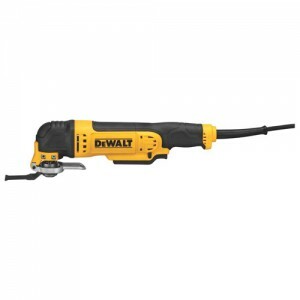 After the Fein, the Dewalt’s DWE315K would be my second choice. Like the Fein, it really feels solid in your hand. Weight is similar, and it just feels very substantial. It performs similarly to the Fein, but I prefer the Fein blades and accessories. The wider speed range of the Dewalt does make a difference for detail sanding. Lower motor speeds will heat the tool up as well, limiting lifespan. This is probably why the Fein starts at 10,000, which does work pretty well for sanding. The Dewalt adds some features that some may like, such as the LED, which does make working with the tool in dark recesses a bit nicer. The variable speed trigger isn’t as useful as you would think. I find it a bit more difficult to use because of that. I prefer to set and go, regarding the speed. The 10’ power cord is adequate. The blade change mechanism is solid and very easy to use. Overall, this is a nice tool, and at about $50 cheaper than the Fein, reasonably priced for what you get. The Makita TM3010CX1 is another quality oscillating tool that gets the job done, but it lives in the Fein shadow as well. 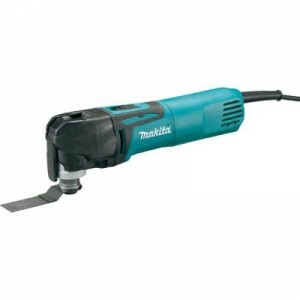 It has plenty of power, but it not quite as well balanced as the Fein, which means a little more vibration and hand fatigue. Overall, this tool is solid though. The weak link is the accessories. Like the Dewalt, you can use Fein attachments on the Makita, and I highly recommend doing just that. 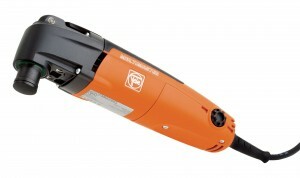 The motor operates in a similar but larger range than the Fein, from 6,000 to 20,000 RPM. Overall, the feature set of this tool is more spartan than the Dewalt. No LED, no variable speed trigger. The tool-less clamp system is simple and rugged. Overall, this is a fine quality tool, performing close to the Fein and about on par with the Dewalt. All three tools are professional grade, and will perform well for you, especially when used with the Fein attachments, which all 3 do. This entry was posted in Reviews and tagged flooring, DIY, Power Tools, Polishing, Buffing on August 27, 2014 by Badsero. When shopping for knee pads, the most important thing is comfort. 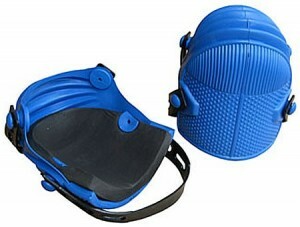 We carry a broad assortment of knee pads, both hard and soft shell version. Today I’m going to give you my take on my favorites from our catalog of soft shelled knee pads: Troxell USA Super soft, Troxell USA Leather Head, Barwalt Super Soft, and Master Wholesale Gel single strap. I’ve worked in all these knee pads and this is not only my experience but also feedback from our customers. Although it’s not cheap, my favorite knee pad is the Troxell USA Leather Head XL. 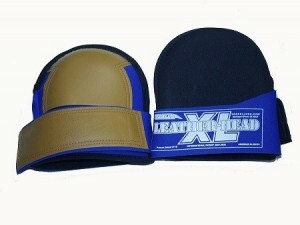 These have a an extra large pad made of neoprene, covered with a sturdy leather on the working side. The have a single strap, which really is quite comfortable, being soft and pliable neoprene. Long life memory foam padding makes these feel like knee pillows! A top notch product. I also like the Troxell Regular Super Soft knee pads, almost as comfortable as the leather heads, but they are smaller, little less padding, not as long of a service life. They are about about half the price of the Leather Heads. Third place goes to Master Wholesale Black Gel knee pads. These use a high quality gel foam pad with a single velcro strap, with secondary strap to keep Velcro strap from coming loose. These pads have a plastic face on them. These are pretty comfortable pads, and priced well. Of the four, I’d say the Barwalt Super Soft knee pads would be my fourth choice, despite being quite comfortable. These would probably be my second choice if padding memory was better and straps where more durable. 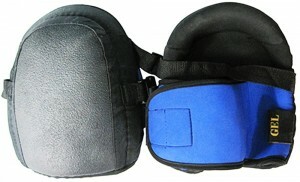 You really can't go wrong with any of these knee pads, as they are all quite durable and comfortable. If your pro and on your knees all day, you know to it’s worth the extra money go with the best knee pads you can get, so I’d suggest the Troxell Leather Heads. For the rest of us, any of these will do just fine. This entry was posted in Reviews on August 7, 2014 by Badsero.